Bless us, father, for we have the best costumes found on this earth. Yes sayeth us, the costume keepers. Now is the time of the costuming, when all those of the earth must submit their finest clothings and fabrics for judgment. Ye who wear these costumes are hereby the most righteous and holy among us. Only ye can lead us to our rightful costume salvation. Ye must walk the righteous path and resist temptation, for ye art thou holiest of all dudes, as it is written. Woe to all the uncostumed heathens who walkest among you, for theirs is the sinful and arrogant way that leads not to the cool parties, but to damnation and sitting at home like a bunch of schlubs, so sayeth we all. Carry your divine guidance to them, oh father, for they will see the light and be cured of their wickedness, or if not, you'll have a wicked awesome story to tell your friends. For without a wicked awesome story, a party becomes boring, as it is written. Now you too can join the most prestigious holy order with this costume. Fit in to any church, or have anyone come to you for guidance. 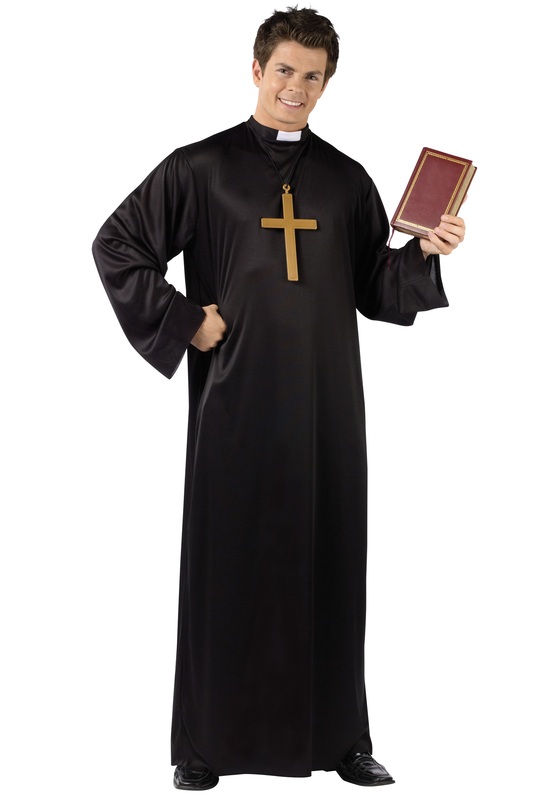 Get out of speeding tickets, or marry people with an extra fancy flair, all with this simple priest's robes. The people turn to you, dear father. How will you guide your flock? Say a prayer for the most awesome parties and best friends to join you. May a blessing be upon you as you show up looking better than anyone, and holier too. It is your divine fate, faithful servant.